I'm a Reginald Hill fan and especially enjoy Pascoe and Dalziel but holy guacamole !! Brain Glover is not the right narrator!!! This is the second time I've bit on a R. Hill book only to find a poor performance. Note to self: Pay attention to name of narrator!! Frankly, I don't know if this is a good story or not -- I could barely understand most of it and could feel my ears clamping down the rest of the time. I love Reginald Hill's novels, and thoroughly enjoyed an earlier audiobook, Deadheads, read by Col in Buchanan. However, Brian Glover, the reader on this and, sad to read, several other Hill audiobooks, in not in the same class. The character voices are inconsistent, he seems to be almost screaming in many parts, and his accent is hard to understand. I'd give this a two, except that Hill's writing almost overcomes the defects caused by the reader. The reader takes what may have been a good story and ruins it. His reading is uneven in volume and pace and even is monotone at times. He hurries along as if he is going to be paid a bonus if he finishes the book more quickly. His interpretation of voices is so vague that you cannot easily tell who is who. Dalziel, with his frequently mentioned size, has a high-pitched voice that rightly belongs to a smaller person. All of this makes finishing this book a matter of endurance, which is a shame. I like the series. Before Pascoe marries, Ellie clashes with Dalziel, who, in classic Dalziel fashion, wants them to get married. This is the side plot to a good murder story involving old friends (of Peter and Ellie), found murdered in a country cottage. The battle in the antique store is a memorable Dalziel escapade. I agree that the narrator (Brian Glover) is not as good as Colin Buchanan. Glover's voice for Wield is weak. But he's not terrible; I've listened to this audiobook several ties. What didn’t you like about Brian Glover’s performance? 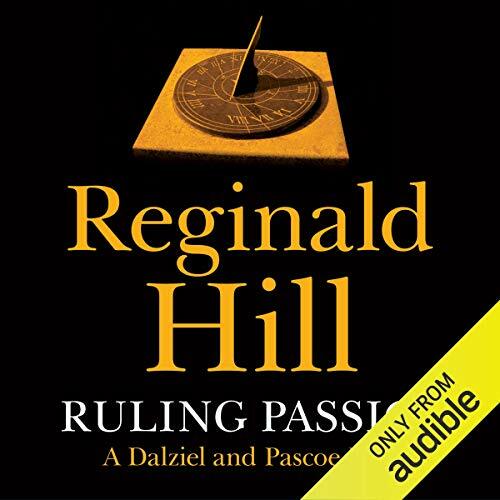 A huge Reginald Hill fan, I have books, DVDs, tapes and audiobooks for most of Hill's titles and all Dalziel & Pascoe series. Brian Glover's gutteral delivery on Ruling Passion, apt for Dalziel, grates for the other characters. Too bad. Also, supposed to be unabridged, some dialogue appears to be missing. Oh, well, it's still a treat. Story is intriguing enough to hold interest. Pretty long for one sitting, unless one is an invalid and in bed all day. It takes some concentration, and will hold up over a few days or more. "Ruling Passion" is well-written and intriguing enough that it captured me from the start, and I wanted to find out how it ended...but the narration was so sloppy that it was a real struggle to stay with it (though I finally did manage to finish). I can tell the narrator is capable of better. Was he unprepared? Bored? Distracted? His reading was halting, and his odd phrasing often obscured the intended meaning of sentences. What a shame. The book deserved a better performance. He speaks incredibly rapidly and in a near monotone. It's like listening to a nervous graduation speaker, this one with a British accent. I'm a big Reginald Hill fan, and enjoyed the writing and storyline as usual, but the poor quality of the narration and audio overall really gets in the way of this one. It sounds like a very old recording has been tranferred to digital format, and suffered a great deal in the process. I've recently discovered the Dalziel & Pascoe series, and was at first excited to find so many of the novels on Audible. Unfortunately, the older ones from the BBC (of which I've heard 2 so far) have AWFUL sound quality. Overall, the audio is muffled, but there are also bursts of background noise, and several dramatic changes of speed & pitch. In addition, while I enjoyed the narrator's accent, he inexplicably chose to use a high-pitched nasal whine for Dalziel, and his method for adding drama to a passage is to ascend into a near-shriek. I enjoyed the story nonetheless, but very much in spite of the narrator and the audio. I hope the author can get the audio rights to his earlier novels back and have them re-recorded -- preferably read by Shaun Dooley!